Jelina Williams (alternately spelled Gelina) was my 2nd great-grandmother. 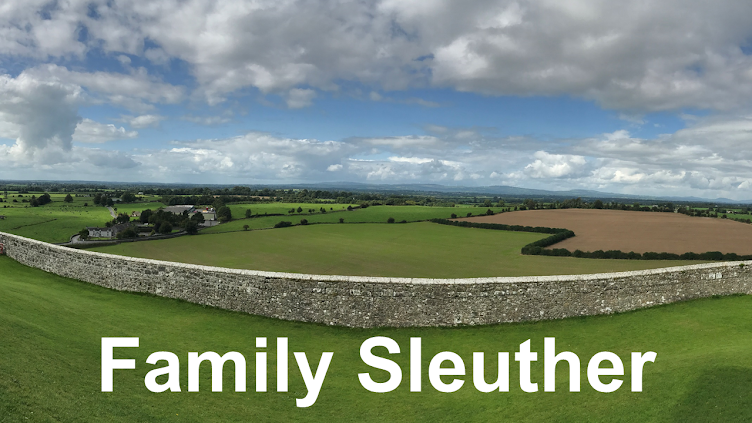 She was the wife of John O'Connor and mother of Robert O'Connor. A year ago I knew nothing about her - not even her maiden name. From the Colorado State Archives, I learned that John O'Connor filed for divorce from Jelina in Denver in 1922. In the divorce record, John indicates that they were married in Rolla, Missouri in 1902. 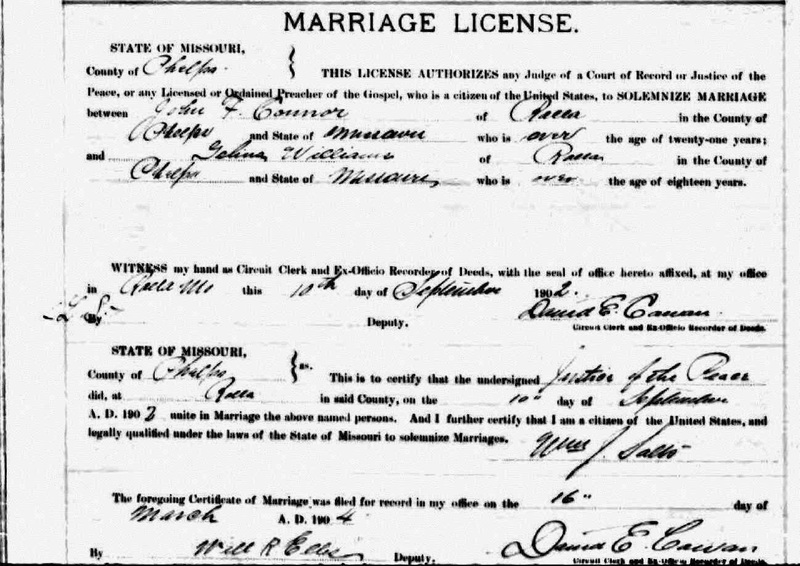 With this information, I was able to find their Missouri marriage record online. I next searched census records for Rolla and that's where I found the 1900 Federal Census with Jelina living with her parents Johnson and Caroline Williams (my 3rd great-grandparents). In the 1922 divorce record, John also states that Jelina deserted the family in July 1919. After this divorce record, the trail for Jelina goes cold. Did she remarry and change her last name? Or did she die as Jelina O'Connor? Did she stay in Colorado or move home to Missouri or elsewhere? I was stumped and had no idea. 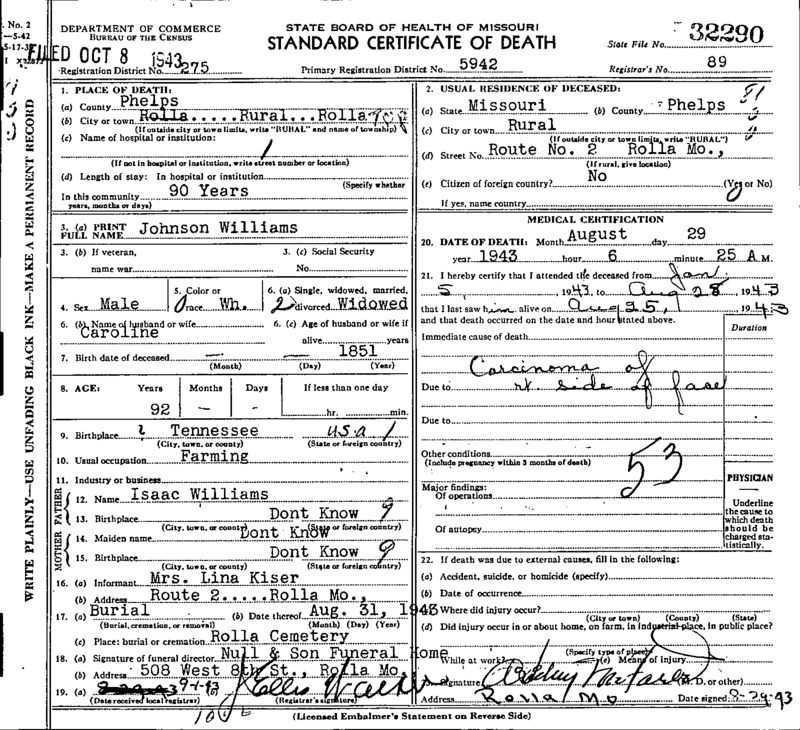 Eventually, I came across the 1943 Missouri death record for Johnson Williams, and was struck by the name of the informant for his death: Mrs. Lina Kiser. Could this be Jelina (by a nickname) remarried with a new surname? A search of Find a Grave in Rolla turned up a record for Fred Kaiser. The grave inscription said that Fred was the son of Henry Kaiser and husband of Lina. This led me to the 1940 census, where Fred and Lina Kaiser's household also includes Johnson Williams (who's listed as being the father in law of Fred). I quickly found the death certificate online for Fred Kaiser, which lists his wife and informant as Lina. I next found the marriage license for Lina Connor to Fred Kaiser. It mentions that she's from Denver. 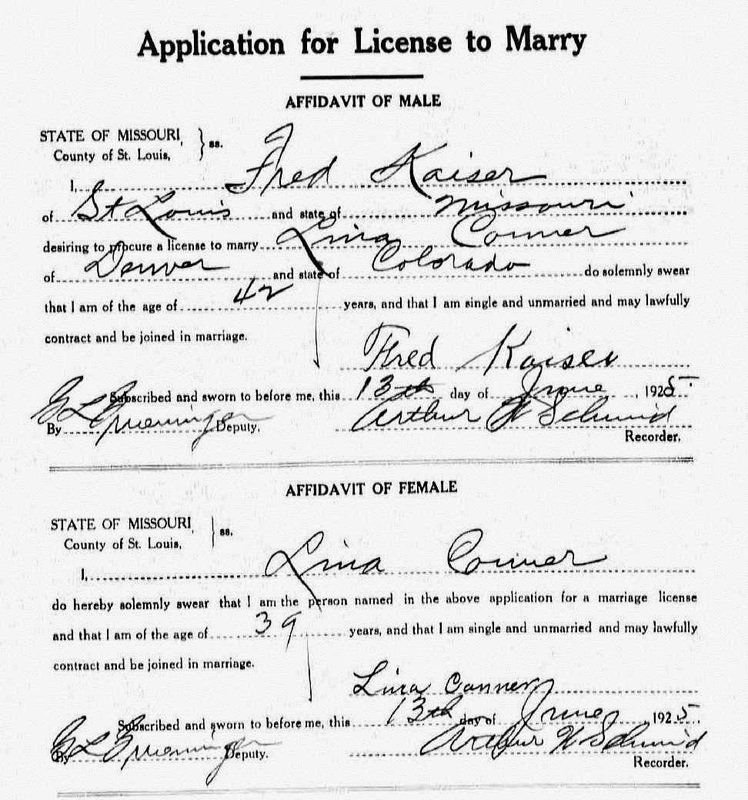 With this preponderance of evidence, I'm pretty sure Lina Kaiser is my Jelina Williams; remarried in 1925 in St. Louis, Missouri - her second marriage. I began corresponding with a user on FindAGrave.com who lives near Rolla. I asked him to provide a photo of Fred Kaiser's grave stone because his grave website said the stone had the inscription "husband of Lina." I wanted to see if the stone was a shared marker that provided her death date and therefore would confirm she was also buried in the cemetery. This guy had local burial records for the cemetery that confirmed the names of everyone buried in the grounds. He told me there were no other Kaisers buried in the cemetery. However, he also told me that Fred was buried in the same plots as Johnson and Caroline Williams (Jelina's parents). At this point, I was even more certain we had the right woman (double confirming that the Lina Conner from Denver who married Fred Kaiser was our Jelina, daughter of Johnson and Caroline). He said the records showed a grave between Fred and Jelina's parents, and that he would take photos and let me know what - or who - was there. He came back with a photo of Fred's grave which only included dates for him - no shared marker with Jelina. However, he also informed me that there was a gravestone between Fred and Jelina's parents. The marker was for a Jelina Williams Trimble who, according to the burial records, was a daughter of Johnson and Caroline Williams. I did some online research for Jelina Trimble and found a couple Ancestry.com pages where people are researching an apparent husband, Willie Trimble. This Willie Trimble was born in 1895 and died in 1983. The Ancestry pages have him remarrying to Jelina after the death of his first wife. Unfortunately, none of the pages provide a marriage date or location. It looks like he lived mostly in Kentucky and briefly in Illinois and Indiana before being buried in Rolla (but a different cemetery from Jelina). I haven't been able to locate a marriage record. It's entirely possible that after the death of Fred Kaiser yet before marriage to Willie Trimble that Jelina remarried someone else thus changing her surname again. I believe I have a hard copy of the marriage certificate for Willie & Jelina. They lived in Rolla, MO & may have been married there. It would have been between 1959 & 1961, I think. Because of a recent move, I'm not quite sure where my copy of the marriage license is, but will keep your message here & let you know when I find it. 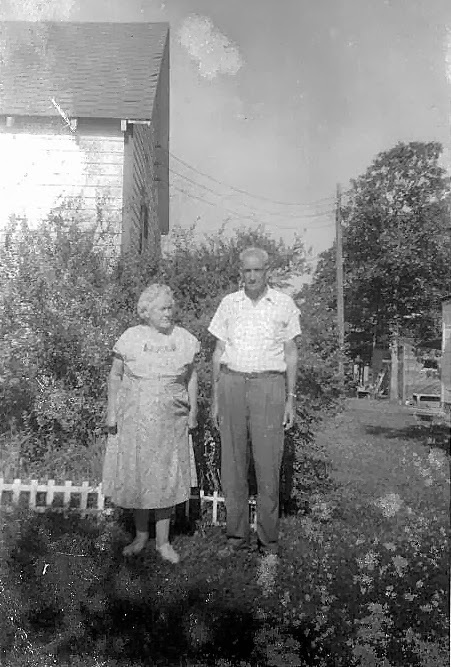 I visited Willie & Jelina 2 or 3 times in Rolla when I was in grade school in the 1960's. We called her Grandma Jemmy (or possibly Jimmy?) & I believe Jemmy may have been a name she went by with other people as well. She was a round little woman with pretty white hair, a twinkle in her eye and hands crippled by arthritis. She was always very sweet to us kids (though she seemed to favor my brothers over my sister & I). And, like my grandfather, she was a hard worker, always busy in her garden or in the house when we visited. I have a photo & will be posting it as soon as possible. When it goes up, you're certainly welcome to snag it for your own tree. From nothing to a photo. I know more of her chronology, but I still haven't uncovered or grasped what led her to abandon her family in 1919, as John suggested in his divorce petition. I hope to locate others who knew her and could help flesh out more of her life.